"Beauty is unbearable, drives us to despair, offering us, for a minute, the glimpse of an eternity that we should like to stretch out over the whole of time." Al really needed to lighten up a bit. Plenty of beauty lasts longer than a minute. My certainty on this point follows a recent, extended visit to the most beautiful food shop in Prague. 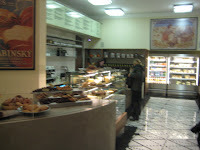 I'm talking about the newly-reopened and lovingly-remodeled Bakeshop Praha on Kozí, near Old Town Square. It's just gorgeous. Good enough to eat. The Art Deco signage, the taut awnings over creamy white walls and glowing windows, are especially impressive after dark. Well-designed lighting works its magic. This place is ready for its closeup. I stepped inside and saw that the beauty was more than wall-deep. The shop is now twice the size it used to be, and twice as good. 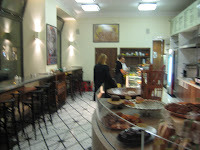 The spycam pix are a little blurry, but you can see there is still a small counter with stools if you want to eat in. The shiny, black and white tile floor is really well-done and adds a great deal of style to the room. 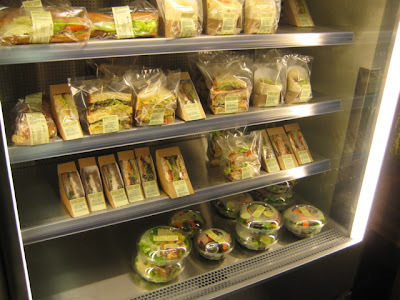 On the opposite side, where the shop expanded, is where you will find the refrigerator case holding the sandwiches, salads, and bottled drinks. 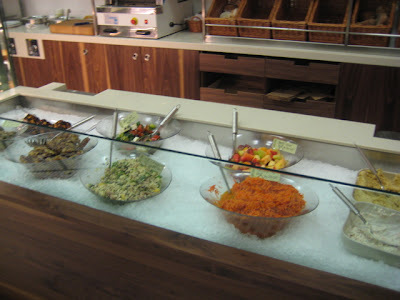 This self-service is a big improvement over the old Bakeshop Praha, where you couldn't see the sandwiches behind the glass and plastic packaging, and you had to be helped by the staff to get them. Some highlights from the sandwich menu are curried egg salad (95 CZK), hummus wrap with fresh mint and coriander vinaigrette (95 CZK), avocado BLT on a baguette (110 CZK), red pepper pesto chicken on rosemary bread (150 CZK), and goat cheese with rucola and tomato on walnut bread (145 CZK). They have a sandwich called a "Sloppy Joe," which is turkey breast, coleslaw, Swiss cheese, and spicy Russian dressing. It costs 125 CZK. I have to say, I did not love it. The bread had dried out and was a bit stale. The turkey was pretty dry. The coleslaw was fairly flavorless -- pretty much just shredded cabbage and carrot. I didn't detect much mayo. The dressing was my favorite part -- it had a nice kick. It was also pretty small. For the money, I'd go for a Culinaria sandwich, which are pretty good, but for the most part, do not earn the top marks of sandwich arts and sciences. 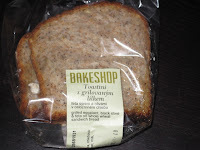 Also in the refrigerator, there is eggplant "toastini" made with feta cheese and olives. It was loaded with soft, creamy cheese, but this really overwhelmed the eggplant. The first few bites were pretty good, but with the olives thrown in, it was far too salty. It's not that big a sandwich and I didn't want to finish it. I think they need to work on the balance of flavors in these sandwiches. 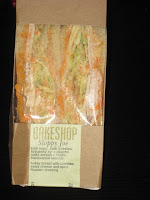 I didn't try them but you can also get a chicken Caesar "toastini" for 125 CZK. Or a ham and cheese toastini or tomato and cheddar toastini for 95 CZK. 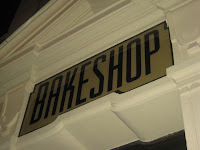 Of course, Bakeshop Praha is famous for its fresh-baked breads. Almost all are sourdough -- there's a wide variety: walnut, potato dill, rosemary olive oil, black olive, multi grain, bagels or baguettes. There's also white and wholewheat sandwich bread and they even do challah with poppy and sesame seeds. They keep a number of salads on ice and on display. On the menu there's a Moroccan carrot salad with garlic cumin dressing, a baby spinach salad with goat cheese, candied walnuts, apple, and red onion. One I'd like to try is the spicy Thai salad with baby spinach, rucola, cucumber, carrots, chili, and peanuts in a spicy Thai vinaigrette. I assume not all salads are prepared in advance, so if you have your heart set on something, it is probably good to call ahead. Then there are soups -- Tuscan white bean, corn chowder, and roasted eggplant to name a few. 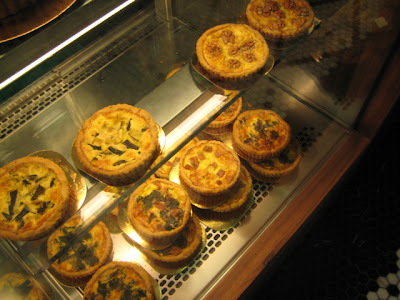 They have at least six types of quiche. A mini-quiche is 80 CZK. One of my favorite savory items is the goat cheese pie with fresh tomato and herbs. 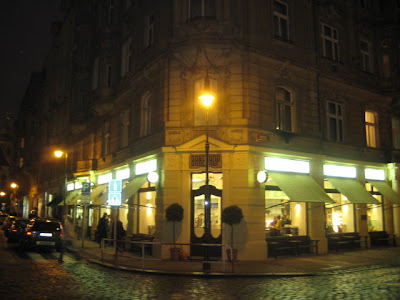 A slice is 160 CZK. And I'll warn you -- the crust is something of a butter bomb. Lets move on to the sweet stuff. There is a list of cakes on the Internet menu -- I wish it were longer. A slice of a devil's food chocolate cake with rum and espresso is 90 CZK. A whole, standard-size cake is 900 CZK. Not cheap, but sounds good. All cakes also come in a "large" size. 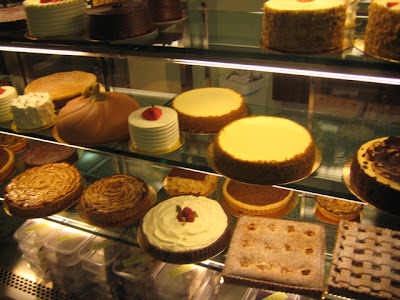 A New York cheesecake with hazelnut biscotti crust is 80 CZK a slice, and 795 CZK for a whole one. There's a separate menu for pies and tarts. 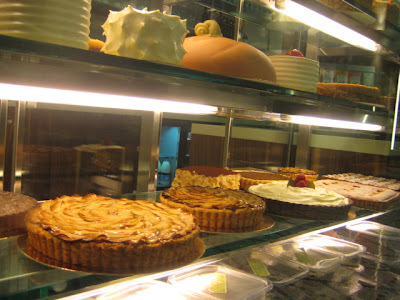 Take your pick: French apple tart, star chocolate pie, death by chocolate and more. Prices are similar to cakes. I'm a fan of their loaf cakes. Most are 40 CZK for a slice. There are varieties like lemon buttermilk and banana walnut. But my favorite is the Kahlua chocolate. It is wonderfully moist, even after sitting on display for a while. 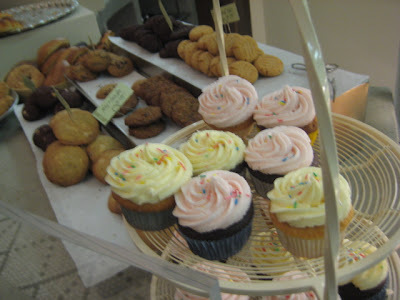 They've has also joined the cupcake trend sweeping the world, thanks to places like New York's Magnolia Bakery. At Bakshop, they are 55 CZK. Small cookies go for 15 CZK and big cookies are 35 CZK. 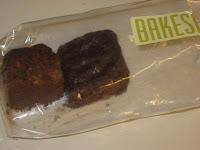 But perhaps the treat I've had most often is their caramel coconut almond brownie for 25 CZK. They may look a little small, but these things are dense, chewy little energy boosters. In the end, I'd say I spent a good 10 minutes just staring at the beauty, architectural and edible, that Bakeshop Praha has to offer. I could have stretched it out longer. I did feel some despair after I left, but that began with the memory of having to read Camus in school. In French. could you perhaps consider posting photos on which there is actually something recognizable? You seem to be good at quotations but less so at photography. A tripod would help you immensely. A tripod is a nice idea. Except that, as a practice, I do not introduce myself to the employees of the shop. If I did, in most cases, you would get no pictures instead of blurry ones. While the old favorites at Bakeshop are just as good as before, I have to say I have been disappointed with most of the new offerings. I think they need a month or so to work out the kinks. Just got back from the place based on your review. Got the hummus wrap -- very nicely done, a good, solid sandwich, very generous on the tasty hummus and cilantro. Alos picked up a loaf of the whole-wheat bread. Now, wow! That's a really decent, delicious hunk of break. Looking forward to making some grilled cheese sandwiches tonight. Thanks for the tip, you have improved my quality of life here in Praha. Has anyone tried the New York Style Cheesecake, by any chance? I'm dying for US style cheesecake and have been sorely disappointed by the Czech iterations I've found.